Isetatsu: Beautiful, cute, original, and loved―even by van Gogh! 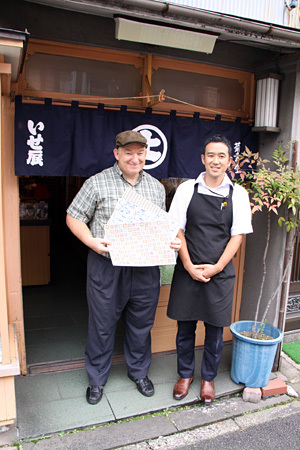 This time, Thayne-san, I’ll be introducing you to Isetatsu, in Yanaka. It’s an Edo chiyogami shop. Well, that’s in my neighborhood. I’ve been looking forward to today. Hello, Thayne-san. I’m Takahashi Gento. Your ukiyoe sign is hard to miss. I noticed some foreigners in your shop a moment ago. This kind of shop really draws you in, doesn’t it. Thank you. We really do get a lot of non-Japanese customers. Your shop is full of chiyogami and things made with it! About how many kinds of Edo chiyogami do you have? We have about 100 different designs, but if you count color variations it comes to about 500. Chiyogami is Japanese paper (washi) printed with different colors and patterns using woodblocks The Kyo-chiyogami of Kyoto are traditional designs like that on a kimono, and the blend of colors is very elegant. Edo chiyogami, on the other hand, was influenced by kabuki, and is characterized by lots of bright colors and patterns, with liberal use of reds, yellows and greens. Basically, the patterns used for chiyogami are the same as those of the kimono, but since commoners couldn’t afford to buy very many kimono, they settled for dressing dolls in kimono of chiyogami. In addition to traditional patterns from the Edo period, we also have chiyogami designed by artists active from the end of the Meiji period through the Taisho Period. Wow, this is really cute. It’s so original and stylish. Yes, that one’s quite popular. What’s fun about chiyogami is that while you can put one piece in a frame and enjoy it like that, you can also fold them into kimono for dolls, and paste leftover pieces onto boxes and, so on. However you use it, it makes a neat design. Combining different designs like patchwork also looks nice. Nothing’s wasted. Combining designs reveals a totally unexpected beauty, doesn’t it? The patterns give it a refined look. 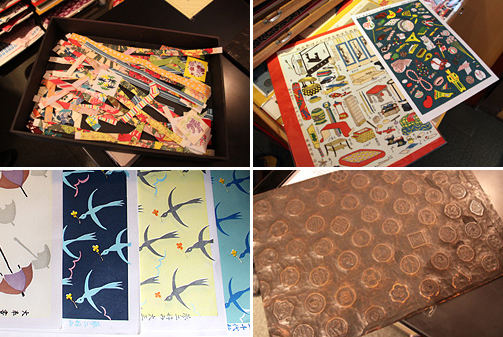 Edo chiyogami is basically made using the same process as that for ukiyoe. The painter paints the design, the sculptor carves the picture into the wood, forming the woodblock, and finally the printer prints the design onto Japanese paper. The artisan in charge of each step of the process needs to have a good artistic sense and be highly skilled, so although chiyogami is not fine art, a lot of craftsmanship goes into it. For example, gradations of color are used to show depth, and this really depends on the skill of the printer. Finally, the publisher is who brings the painters, sculptors and printers all together―as our founding fathers did. When did Isetatsu first open its doors? In the first year of Genji (1864), at the end of the Edo period, the first generation of the business opened a color woodblock print and uchiwa (Japanese fan) wholesale shop in Horie-cho in Nihonbashi. Later, in the third year of the Meiji period, the second-generation owner moved the shop to Benkeibashi in Kanda. The shop received lots of attention during the Westernization movement, and sold chiyogami articles and color woodblocks in the foreigner’s district in Tsukiji and to foreign companies in Yokohama, and even exported items to Europe. Apparently, the third-generation owner was of a refinement only found amongst the locals of Kanda, and grew the business through his many contacts in the performing arts. However, in the Great Kanto Earthquake of the 12th year of Taisho (1923), we lost all the chiyogami woodblocks, the very lifeblood of our store, and of course our entire collection of chiyogami. For a time, we didn’t know what to do, but the third generation’s children and apprentices were able to help replicate about a thousand of the chiyogami woodblocks. Also, in the 17th year of Showa (1942), the shop moved to its present location on firmer land. Unfortunately that wasn’t the last of the disasters―during World War II, the shop was destroyed by fire, and we lost everything. Thankfully, some of the woodblocks had been evacuated, and by copying those the fourth generation rebuilt the shop from nothing. Goodness, what a terrible loss! I can see your shop has gone through plenty of tough times. It’s really a shame that we can’t show you all the chiyogami made in the Edo and Meiji periods, since our woodblocks and reference materials from that time were all lost to fire. Incidentally, I was recently was told by an expert that our chiyogami appears in van Gogh’s famous Portrait of Pere Tanguy. Wow, drawn by van Gogh! Van Gogh became a big fan of ukiyoe and made his own imitations, and apparently he liked the chiyogami of Isetatsu. If the second and third generation owners knew that, they would have been very pleased, I’m sure. I think you’re right. The third-generation owner would have been especially pleased since he spent all his personal life in the world of entertainment and the arts and, from what I hear, he was quite the socialite. The fact that the kabuki actor Naritaya gave us permission to use his trademarked logo “kamawanu” in our chiyogami designs also was born out of the friendships cultivated by our third-generation owner, so I hear. I feel really thankful for the shop’s founders because if it weren’t for them, I wouldn’t be here in this shop, employed in this business. Your shop sure has strong generational ties. Today, as the fifth generation, my three siblings and I each have a role to play in preserving its reputation.